Reverse It,” is up on the SI website. I recount the rise and fall of power posing and also describe a new open science initiative aimed at strengthening research. If these new methods are adopted, they should produce results that are more trustworthy and less likely to be overturned. The January/February 2017 print issue of Skeptical Inquirer is on news stands now, including my column “Consensus: Can Two Hundred Scientists be Wrong?” This is the print version of an article I wrote online back in September. In the back pages, I also provide some pithy responses to letters sent in by readers. Finally, if anyone is spending the holidays in the Boston area and missed out on seeing me on the WCVB TV program Chronicle last October, you have another chance on Wednesday, December 28. The Chronicle segment “Are You Superstitious?” will air again on that date at 7:30 PM on ABC 5. Of course, no matter where you live, you can see a video of that show any time you want by simply clicking here. That’s all for now. Have a happy and safe holiday season. Happy December! Just a quick note to prove I’m still here. Almost a year ago, while sitting in the lovely Espresso Library in Cambridge, England—one of my favorite coffeeshops in all the world—I was interviewed (via email) by Ella Rhodes, a reporter for The Psychologist, a monthly magazine published by the British Psychological Society. The article she was working on finally appeared as the cover story of the November issue. You can read it online here. Then rather surprisingly, Ella Rhode’s piece was used as a source for another article on superstition in The Irish Catholic, which is described as Ireland’s biggest and best-selling religious newspaper. I am fairly certain this is the first time I have been quoted in a Catholic newspaper. You can read the article here. Finally, I was recently invited to contribute an article to a special issue of an academic journal. The editors explained that they had solicited participation by several “thought leaders” in the field, myself among them. I was flattered and quickly accepted the invitation. an individual or firm that is recognized as an authority in a specialized field and whose expertise is sought and often rewarded. The phrase “thought leader” is identified by some writers as an annoying example of business jargon, and appeared in Forbes magazine’s 2013 annual “tournament” of “corporate America’s most insufferable” business buzzwords and clichés. I have just returned from a great visit to Las Vegas to participate in the 2016 CSICon conference, put on by the Committee for Skeptical Inquiry. Although Las Vegas is not a destination I would otherwise seek out, I had a wonderful time. I heard great talks by James Randi, Elizabeth Loftus, Richard Dawkins, and Lawrence Krauss. My own talk, “Is Brain Training a Scam,” was not recorded, but the Center for Inquiry, CSI’s parent organization, was live blogging the conference. You can read the blog post about my talk here. Just one week to election day. Be sure to vote! Just today I was quoted in a very good article on superstition in U.S.News & World Report. The piece, entitled “How Superstitions are Affecting Your Behavior,” also quotes Jane Risen of the University of Chicago Booth School of Business, who has done some very interesting work on jinxes and on the conflict between our intuitive and rational selves. Our rational brain often tells us a superstition is silly, but our intuitive side forces us to be superstitious nonetheless. Finally, for months I have been looking forward to attending the Committee on Skeptical Inquiry‘s convention, CSICon 2016, in Las Vegas this weekend, but now, due to a last minute scheduling change, it looks like I will also be speaking at the convention. Other speakers include Richard Dawkins, Lawrence Krauss, Elizabeth Loftus, Paul Offit, James Randi, and many more luminaries of science and skepticism, so I am quite honored to be selected to pinch hit. You can learn more about CSICon at the conference website. Given the short notice I will present an updated version of my July, 2015 Behavior & Belief column, “Neuro-Pseudoscience,” which is about the brain training industry. On October 7th, I appeared on Boston’s WCVB TV evening magazine program Chronicle. The subject was superstition, and the story reported a number of interesting Chinese superstitions and superstitions of the theater. You can watch the first segment, which features me, by clicking here. I make only a brief cameo in the second segment, which you can watch here. That’s all for now. Enjoy the delights of autumn. It has been a quiet mid-to-late summer for me, but enough has happened to justify sending out a missive. My August column for Skeptical Inquirer, “Consensus: Could Two Hundred Scientists be Wrong?” has just gone up. I report on a controversy caused by the release of a new book about H.M. (Henry Molaison), the world’s most famous amnesia patient. I also consider the larger questions of (a) when is a scientific consensus something we should pay attention to and (b) when should scientists add their names to petitions, statements, or letters of support. I recently published my fourth introvert piece, “An Introvert’s Guide to Daydreaming,” in The Coffeelicious collection on Medium.com, and the nice people at the New York Observer were kind enough to reprint it on their site. Happy Labor Day weekend! Let’s hope the warm weather lasts a bit longer. My latest piece for Skeptical Inquirer, “Kitty Genovese: Revising the Parable of the Bad Samaritan,” is up on the web. The 1964 murder of Kitty Genovese in the Kew Gardens neighborhood of Queens, New York, became the symbol of bystander apathy when the New York Times reported that 38 people had witnessed Kitty’s brutal stabbing without calling the police or taking action to help her. A new documentary film, The Witness, follows Kitty’s younger brother, Bill, as he investigates the case in an effort to find out what really happened. The story he uncovers is substantially different from the legendary version that became a standard feature of psychology textbooks. The Genovese case inspired a long line of research into the factors that influence bystanders to help a person in need. That research continues to this day, and I summarize the results of some recent studies. My most recent piece for Skeptical Inquirer, “Fate: Inventing Reasons for the Things that Happen,” is up on the website of the Committee for Skeptical Inquiry. I report on some interesting recent research showing that—from an early age—we have a tendency to think that objects were designed for a purpose and events happen for a reason. All of which poses a challenge for the promotion of scientific thinking. 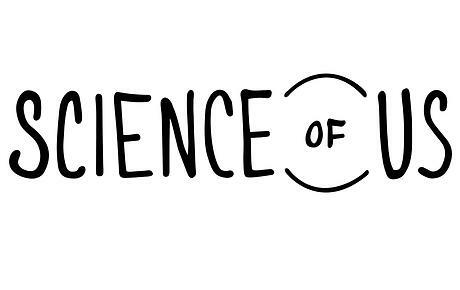 I recently had the privilege of being a guest on the “Science Enthusiast” podcast. My illustrious former student Natalie Newell is one of the hosts. She is also the creator of the Science Moms Facebook page and—with her husband Brian Newell—the forthcoming documentary film, Science Moms. It was wonderful being on the show, and I am so excited about all the new projects that Natalie and her colleagues are launching. Finally, I traveled to the 2016 Reason Rally on June 4 in Washington DC, and I commemorated the event with a new piece in Medium called “Listen to the Weirdos on the Mall.” In it I reminisce about my past trips to large gatherings on the National Mall. Last week I was quoted in an interesting article, “The Strange Power of Unlucky Charms,” written by Cari Romm for New York Magazine’s online blog Science (of) Us. Among other things, Romm reports that, in approximately half the states in the US, landlords are protected from having to disclose to new tenants that a death has occurred in the apartment. Ghost protection. Last month included a Friday the 13th, and although I did not give any new interviews, some of my older material resurfaced. 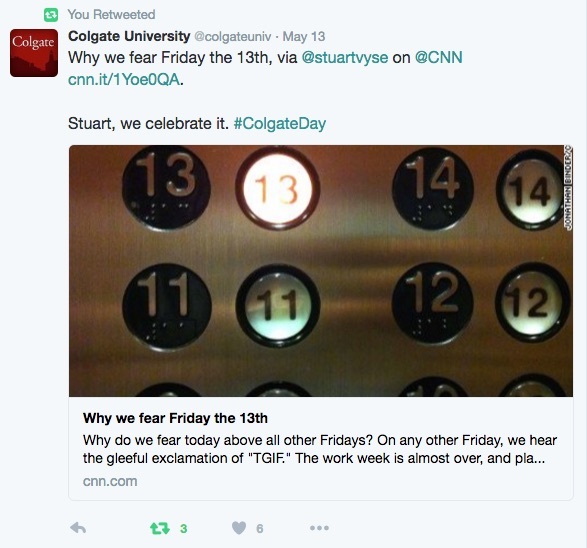 Most notably CNN.com reposted my 2012 essay, “My Take: Why We Fear Friday the 13th.” I discovered the article was out again when I got the tweet below from Colgate University. Evidently Colgate loves the number 13. As this page on the university website explains, “The university was originally founded as The Baptist Education Society of the State of New York by 13 men who each offered $13 and 13 prayers.” So they celebrate Friday the 13th as a lucky day at Colgate. Who knew? Finally, I will soon be a guest on an exciting new podcast, so I will keep you posted about that when the time comes.